This post aims to promote the LNT principles as a good pattern of life-style of every outdoor enthusiast. The Leave No Trace Seven Principles is one of the common outdoor ethics used not only in mountaineering but also in some public places likes parks and zoos. Durable surfaces include established trails and campsites, rock, gravel, dry grasses. Campfires can cause lasting impacts to nature. Use a lightweight stove for cooking and enjoy a candle lantern for light. Avoid wildlife during sensitive times: mating, nesting or raising young. 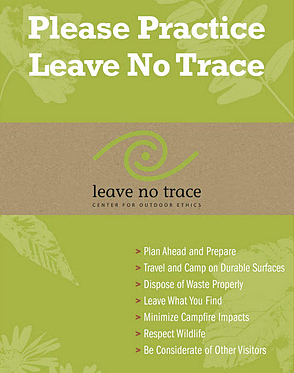 You may contact the Leave No Trace Center for Outdoor Ethics.